Back to the Studio in the afternoon to continue on the current block. I added two more partial figures on the left side of the block, and started blocking in boxes and other containers on the shelves. Next time I'll fix the proportions of the shelved items and make any needed adjustments to the figures, and fill in the details. 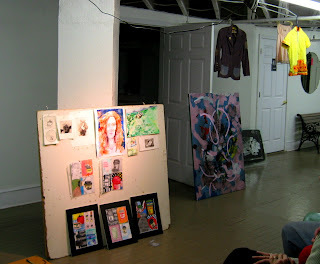 At one point I took a break from my drawing to walk over to The Paint Place, a gallery on Cookman Avenue in Asbury. Today was the first day of a new show of work by Jill Kerwick, a friend of the Studio as a regular at the Social Animal Press critique group. 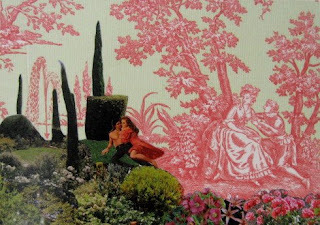 She's primarily a painter, but also does a lot with collage, and has some print background. 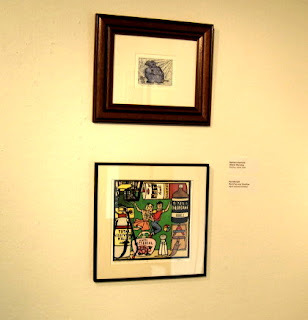 The current show is a mix of paintings and collages (such as the one shown in the 2nd photo), a few of which I had seen before at our group meetings. Jill was there, so we had a chance to discuss the work and the evolution of some of the pieces. The show is up through July 20. After I dropped off my pieces in Belmar, I continued up to the Studio. First order of business was to fix a piece of the framed History of Art print. 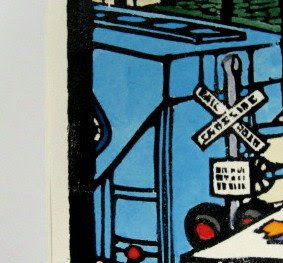 After I framed it for the Georgian Court show, I realized that I had forgotten to color one little piece, part of the logo on the train car. Adding the tiny piece of dark blue (compare first and second) took seconds- much more difficult was getting everything back into the frame. 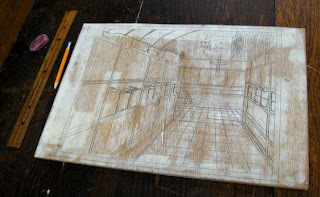 My main purpose in the Studio today was to continue on the latest supermarket block. I roughed in two figures and the shopping cart. They could use a little refining, but they're pretty much what I had planned. I think there will be at least one more partial figure on the far left side of the block, then I have to deal with all the products on the shelves and a few other details. 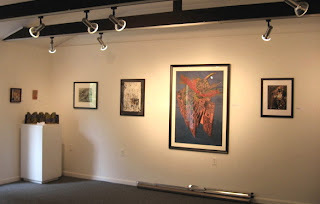 Today was the drop off day for the latest juried show at the Belmar Arts Council. It's called "Food For Thought", a theme that includes food and related topics. 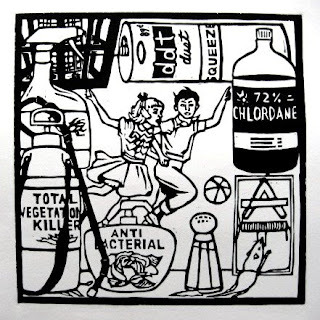 I had thought about some of my supermarket prints for this one, but since the better ones have already been shown there at the Boatworks, I chose a couple of prints from my Ecclesiastes series. The series is my visual adaptation of the book of Ecclesiastes, taking direct quotes from the Old Testament book and bringing them forth to the 21st century. The top one, called A Few Flies, is my take on the saying about the fly in the ointment. 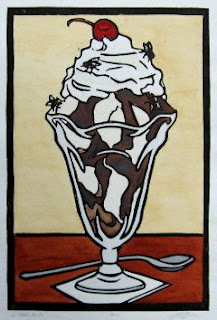 I think that the hot fudge sundae carries the theme better than a jar of ointment. The second is called Money Answers For Everything, which is meant to capture the concept that every feast comes with a hefty bill. The show will be juried over the next few days, but the results may not come for a while, with everything closed down for the holiday next week. I'll have an update sometime before the show opens on July 12. On the way back from Long Branch I dropped by the Studio to advance my latest block a little. I put in a preaching character. Although the original incident involved a lay person, I decided to show him as a priest, to make clear the religious association. I put him in a typical gesticulating pose holding a bible, and using a small in-aisle display rack as a lectern. I will add his audience next time, and then start filling in the details. This afternoon I dropped by SICA to see the 5th annual edition of their Fresh Meat exhibition- a show of art from newly minted MFA graduates from New Jersey schools. A smaller group than usual- only 10 students from Mason Gross/Rutgers and (one of my alma maters) Montclair State. I was told that the other schools had no graduates this year. In general, not the best one of these shows I've ever seen. No prints, which didn't surprise me. Mostly painting, and almost all of that abstractions and biomorphic blobs. Obviously, I'm a guy who likes some content in art. I did like the large painting by John Schiro (bottom photo), more for the color combination than the composition. My favorite exhibit was the series of photographs by Anne Percoco (top photo), which showed forgotten "junk" spaces, slightly off the beaten path locations where society's detritus gathers. This is an interest of mine as well, something I experience every time I ride the train to NYC- the tracks often rest in narrow bands of hidden space, even in the most densely built up towns. Train passengers get to see pieces of landscape (both natural and industrial) that aren't visible to the rest of the world. In the Studio for several hours this afternoon. First order of business was preparing some wood. 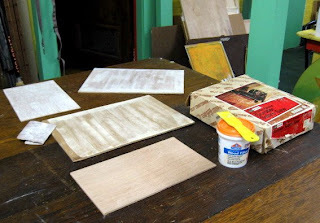 I cut up some scrap pieces, and prepared the surfaces with wood filler. The top photo shows some of those pieces in various states of preparation. Two of the pieces were sanded. On one I drew in the lines for the basic layout of a new saint print and set it aside for another time. 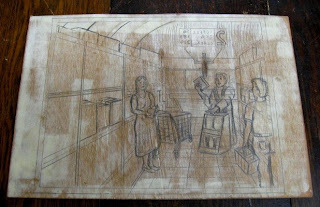 On the other I drew in the border for a new supermarket print, then started drawing in the background. 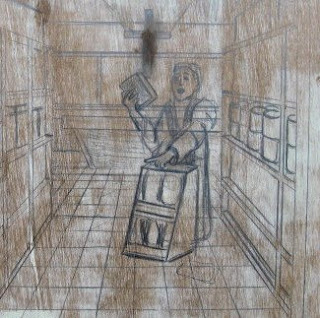 This one will be the story of the religious guy leaving messages inside supermarket products. I based the store layout on the rough sketch I produced last month. This is mostly a one point perspective drawing, modified slightly. I put a few examples of products on the shelves, but I decided not to do the rest yet, since I plan to put in a bunch of figures and I don't want to waste time drawing what may be covered up. In any case, it's a good start. I got up to the Studio for a few hours in the afternoon, mostly to make sure I didn't nap the afternoon away. I spent the time taking notes, doing little sketches, thinking about some upcoming projects. Nothing far enough along to post yet, but I hope to get started on a new project in the next week or so. I spent more time today looking at a book my father found at a flea market this morning. This oversized (17.5" x 15") paperback is a little worn- the cover is detached, but the pages are stapled through the edge- perhaps how he got it for $5. 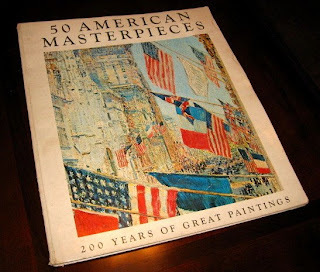 As stated on the cover, it contains images of 50 American paintings; how many are masterpieces is debatable. I'm no art historian, but I know a thing or two about art and have a pretty good memory. And as such, I am familiar with the names of only 20 of the 50 artists (there are a few anonymous pieces), and only know 9 of the paintings. The cover also claims 200 years of American painting, but the vast majority were more than 100 years old (when the book was published 40 years ago), and only 16 were from the 20th century, which is when American painting starts to become interesting and unique. Not that all this means that there aren't some good and interesting paintings in the book. I may have a few of the more obscure ones turned into slides for class in the fall. But it is a lesson on the place in history of artists. At one time, all these artists were celebrated, perhaps in demand. 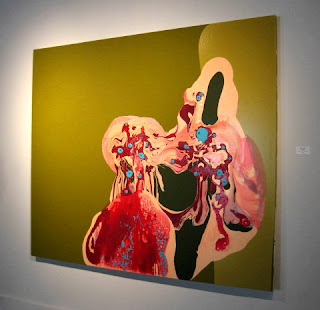 And there are probably collectors today who are familiar with this work and pay good money for it at auction. However, you won't find it in the general art history texts, and it's ignored by the contemporary art world. The reputation of an artist often has little to do with the art itself. It can rise and fall depending on what style is in fashion and what the popular theories are. My prints sit in collections along with some pretty big name artists, but what future print curators will make of them is anybody's guess. Off from work today, but still busy. In the early afternoon I was up in Asbury, distributing mini-prints among some of the people involved in the recent Art Walk, a thank you for all the efforts in getting it done, as well as for including me. 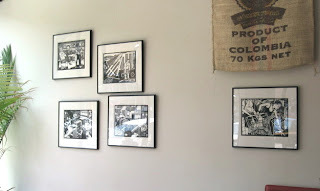 The owner of my spot had asked about coffee images, and while I have no large prints on the topic, I realized that I had some related small prints, the inexpensive large edition stuff I sell at holiday sales and such. 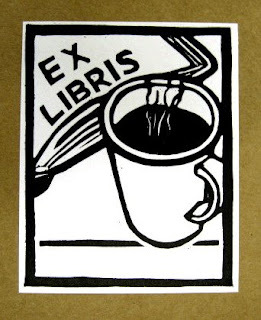 I gave him some of my coffee themed bookplates, and he bought a mini St Dymphna (May 15) for about what I spent on food and beverage in his shop over that weekend. Left the door open for a future commissioned piece to go with his coffee themed decor. Then down the street to Crybaby Gallery, where Jenn selected a St Cassian of Imola (Aug 13) from among the half dozen options. She was having a good time reading the brief saint stories on the back of each print. Another important task was getting some new wood. 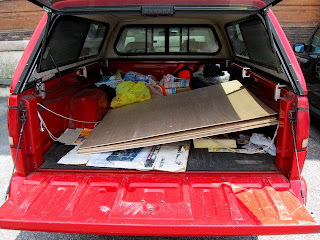 Wanted to take advantage of the truck while I still have it (my next vehicle will be unlikely to handle full 8' x 4' sheets of plywood), and I will need wood for some planned projects over the coming months. The stock was much better for my purposes than what I found on my last visit, so I bought two sheets. As it turned out, I was able to get them cut in half at the store, making them easier to transport and to stash in the Studio, which I did before going home. 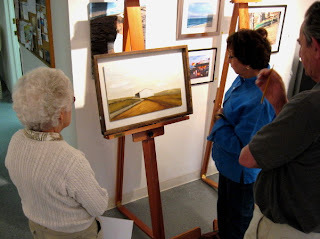 I went to the critique group in Belmar again, a much smaller group than the one that met in the Studio a few weeks ago. Still, it was a fun evening. Some people brought pieces that they didn't know how to resolve, and they got what seemed to be useful advice from the group. I showed a few things done since the last meeting in May- my print for the Global Footprints show, and a few of the better charcoal drawings from the recent May and June figure drawing sessions there at the Boatworks. They wanted an explanation for the print, so I told them the story. The consensus was that I was successful in getting my point across, in addition to making something that had much visual appeal, despite the less than appealing subject matter. 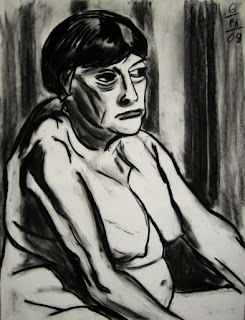 They liked the charcoal drawings as well- mentioning the strength of the drawings and how I seemed to capture the phyical nature of the figures. The evening's discussion ranged over a variety of art topics as well. It's too bad that more people aren't coming, but we'll keep promoting it, and hope that to draw more for the next time. I decided to go to the figure drawing group at the Belmar Arts Council tonight. Other than the organizer, a completely different set of artists from the one I went to last month. Not my best ever day of drawing, but that's why it's good to get some practice. The one shown here is a 20 minute charcoal drawing, my best of the night. A few nights ago I had a series of particularly vivid dreams that related to art. Today was my first day in the Studio since then, so I decided to finally put some stuff on paper. The first part of the dream involved Molly, who brought me a proof of a new print she was working on. It was a very large etching, about 48" x 30" vertical, of a scene in an alley in an urban environment. The print was made with 3 registered plates, each inked with a different color- a bluish black, a medium brown, and a red-orange. 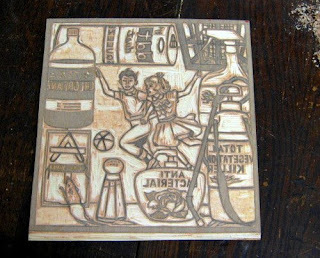 The print was all light line etch, an early state with more to go. The sketch in the top photo gives a very rough sense of what it was, along with the colors. When I told Molly about the dream, she thought it interesting, though she did observe that the kind of image/subject was more like something I would do than something of hers, which is true. At this point neither of us has plans to create such a print. The second dream involved me going to the Studio, starting from Belmar. Got into my truck, parked on what seemed to be E Street near 7th, and drove north. Very quickly the neighborhood changed from it's usual look (nice houses, big leafy trees) to a more urban environment, but a devasted one. Buildings were extremely dilapidated. In my dream it was an extreme urban decay, but it looked more like the results of an earthquake or war zone. Piles of rubble and other garbage were all around. I turned left onto 5th, heading toward Main Street, and my truck morphed into a bicycle, which helped me skirt some of the street obstacles. Besides all this, these blocks were full of people- standing, stumbling, sitting around, all looking haggard, derelict- I'd think they were zombies, except that zombies (in the movies) attack the living, while these people completely ignored me. I assumed they were hopeless addicts. Constantly running through my thoughts (other than wondering why Molly found us a Studio that required passing through such a neighborhood) was the phrase "walking dead". A right onto Main and over the bridge into Avon, and everything returned to normal. 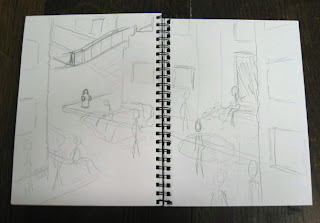 A simplified 2 page sketch of the scene is seen in the 2nd photo. The dream itself had little to do with art, but the visual (with streets, multiple buildings, and many figures) reminded me more than a little of some of my large format prints. I could see this being the source of another one. I imagine this broken city and its residents representing any number of disasters- wars, natural disasters, society's many breakdowns. Not a priority, but I'll keep it mind for a future project. The fact that both dreams involved urban scenes seems to be a coincidence. The alley in Molly's print was relatively pleasant place, where neighbors might chat and kids play. The burned out neighborhood in the second dream was a nightmare- it's probably for the best that I saw no kids there. Today was a busy day up at the Printmaking Council of New Jersey. I missed the morning board meeting, but I'm not on the board so it's ok. I did arrive just as the annual member meeting was beginning, which was the usual- introduction of board members old and new, a few committee reports, some general news. We were introduced to Linda, the new director. After a pot luck lunch we had a slide presentation from Catherine LeCleire, who has recently been Artist-In-Residence there. 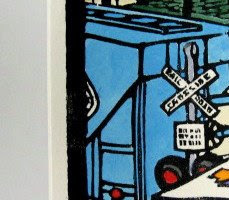 She works in a wide variety of print media, in both traditional and non-traditional formats. 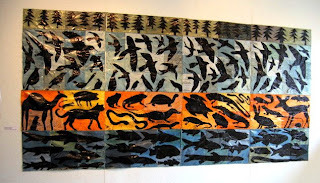 The library was hung with her work, mostly framed prints, but my favorite piece was the one shown in the top photo- black linocut animal silhouettes printed on a backing made from layered and ironed plastic newspaper bags of different colors, sewn together to make the large piece. After that was the official reception for the Global Footprints show in the main gallery. 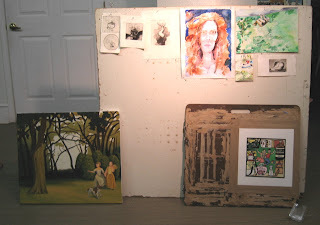 The other 3 photos show show samples of the work, the last one showing my very recently finished piece. The exhibition will remain on display through August 2, then travel to two or three other locations. 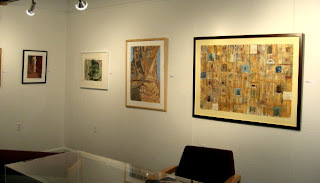 Gallery hours are Wed-Fri 10 am to 4 pm, and Sat 1 to 4 pm. For more information, see the PCNJ website. As planned, after work I drove to Asbury, found another great parking spot on Cookman, and took down my artwork from the walls of America's Cup. Took all of about a minute to pack it up. 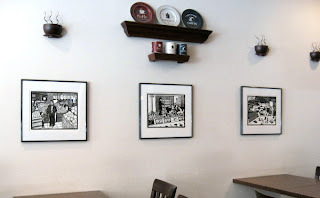 I thanked the owner, who said he really liked how the black and white artwork looked on the walls. Too bad I don't have any coffee themed prints in that series. By all measures, the weekend was a success for Asbury Park, and from talking to one of the organizers yesterday, I know that this festival will be back again next year. What role I'll play in it will be decided a long time from now. 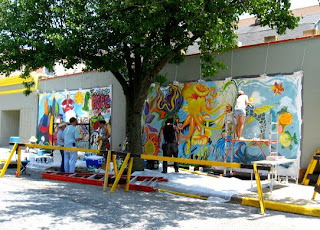 Sunday of the Tri-City Arts Tour was a lot like Saturday- very hot day, not many people on the streets of Asbury Park. The mural crew was busy working, just around the corner on Bond Street. And there were some musical performances around town, inside and outdoors, but I never saw any crowds. Those who came into the coffee shop were there mostly to eat and drink, but I did talk to a few people. And a few of the postcards that I had left behind the night before had been picked up, so at least a few people were interested in my art. Also posted here is composite image of the long wall, showing how all the artwork looked together, with Astro Monkey's stuff in the middle. The owner told me I could leave my pieces up until tomorrow afternoon, so I'll pick it all up after work. In the early afternoon I headed back up toward Asbury Park for the Tri-City Arts Tour. I stopped first at the Studio, where Molly was busy working on an unrelated project. She planned to skip the afternoon in Asbury and go there in the evening. I walked over to Cookman and found that the street was pretty much deserted. I figure the 95 degree heat had much to do with that. Since there was no one around my exhibit, I decided to take advantage of the free time to check out some of the other shows around town. I went up Cookman toward the beach, stopping to look in a few spots. One was a model home in a townhouse complex, which had been filled with art, including an installation of Molly's cut out wooden trees, last seen on the walls of Crybaby Gallery earlier this year. The trees were arranged on the various walls of the stairwell between the 1st and 2nd floor, very effective I thought. I continued a few more blocks up to the boardwalk, where I expected to see a show of art in the Casino building; when I was first searching on the web for information about this festival, the only thing I could find was a posting about a large group show that would be installed there. But I found the building (seen above) completely empty. At least I was able to enjoy the cool space for a few minutes before starting back. Checked out a few more tour stops (and some outdoor mural painting) before heading back to America's Cup. A few people came in, but just to buy food and beverages. I knew one, Rob Ryan, who has worked in the Studio and is the resident of the loft where we saw the Hungry March Band performing last night. Eventually I decided to give up and head home to get ready for a family function. By the time that was over, it was late, so I decided to stay home, let Molly represent me tonight, and come back energized tomorrow afternoon. Quite a busy day today. 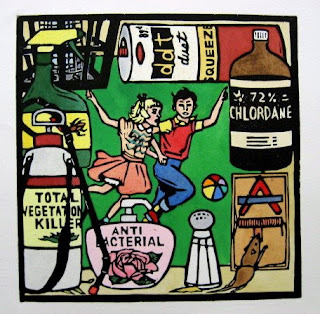 In the morning I framed my new print, which I have titled Pest Free and Carefree, and got it ready to deliver to the Printmaking Council for their upcoming Global Footprints show. Then I contacted the shop owner at America's Cup to verify when I could hang my work. He said anytime, so I gathered some of my favorites from the series and got up to Asbury. I was lucky to find a parking spot just across the street, so I didn't have to carry my stuff far. Ross, the owner, showed me what sections were available, and helped remove the art hanging on those hooks. That left me with eight spots to hang my prints- 5 near the front window and 3 further back on the main wall. The whole thing was up in 10 minutes. From there a short drive over to the Studio, to fill out the paperwork for the Global Footprints piece. A call to my contact told me that I had to kill a little time before dropping it off, so I went into Ocean Grove to catch up with a BAC group. 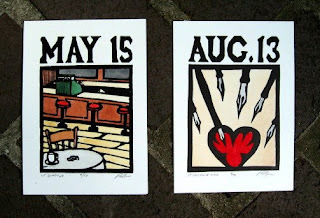 Then down to Belmar, and dropped off my print, which should arrive early next week in time for hanging. In the evening I returned to Asbury to check out the opening night of the 3 day Tri-City Arts Tour. The real action is supposed to start tomorrow, but tonight was pretty wild. Some people stopped by my location and seemed to appreciate my work. Saw several people I knew from the area (galleries, friends of the Studio), got to meet the other artist in my space (Joe, a.k.a. Astro Monkey) who had put up several of his cool little color pieces (shown above), and another participant- North Jersey based artist Dahlia Elsayed, who remembered my work from a group show we were in together several years ago. Probably the highlight of the night was the appearance by Brooklyn's Hungry March Band, who brought their infectiously catchy music up Cookman Avenue, and perfomed in front of my location, in the gallery next door, and even in an artist's loft. Eventually Molly turned up and we checked out a few locations together. We both decided to call it a night around 10 pm, but the street was still full of art fans. I'll be back tomorrow afternoon, when the event really gets going. Tomorrow is the beginning of the 3 day Tri-City Arts Tour. The cities are the 3 artsy towns of Monmouth- Red Bank, Long Branch, and Asbury Park. I'm involved in the Asbury Park portion, the Walk of Art. There are about 100 artists involved in this activity alone, scattered among more than 30 locations. My work will be on display at America's Cup Coffee Company at 633 Cookman Ave, just 2 blocks from the Studio. 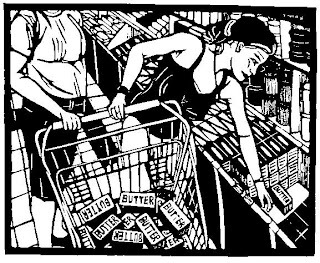 I know that I'll be displaying prints from my series "Scenes from the Grand Opening", based on weird things I've seen in supermarkets. I don't know exactly how many yet, something that we'll work out (I'm sharing the space with another artist- Astro Monkey) when we hang it tomorrow. The official hours of the Asbury Park Walk of Art are Friday 5-10 pm, Saturday 12 noon to 10 pm, and Sunday 12 noon to 4 pm, although my location (being a coffee house) should be open by 8 am on the weekend, and many Art Walk locations may still remain open well after the above mentioned hours. General information about the 3 day festival can be found on the Tri-City Arts Tour website, and a map and list of artists for the Asbury Walk can be found online, as well as around town beginning on Friday. I'll add more details as I learn them. Today we had the largest critique group yet, over 20 people in attendance. Our numbers were swelled by the presence of Molly's students, necessitating a move to another part of the basement, the school's former cafeteria. We brought my portable tackboard out, and Molly put up a clamp light to help with the illumination in this otherwise dim room. Several of the regulars were in attendance, and you can see their work in the top and bottom photos. 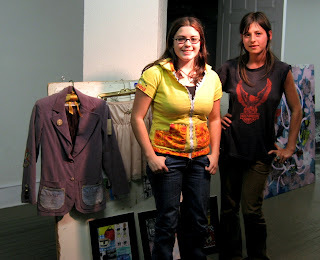 We had some new participants as well, two artists who like to work in textiles- repurposed clothing. The middle photo shows some examples. What made this the noisiest critique ever wasn't our crowd, but the one above us. The cafeteria is right under the stage area of the theater, and one of the groups was up there getting ready for their next production. Occasionally we would hear bits of songs, but mostly it sounded like a cattle stampede moving around above us. Most of the time it was a slight distraction, but once in a while we had to stop talking until the noise subsided. Finally they stopped for the night, only minutes before we did. Next time it will likely be our usual crowd in our usual spot. After work I stopped to pick up some food for tonight's discussion group, then went to the Studio. I stretched a copy of the new print and began coloring. I had everything worked out in my head already, so it went pretty quickly. 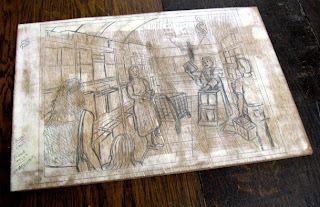 About an hour into it, the Studio was suddenly overrun with college students, guests of Molly, who gave a demonstration of intaglio printing. I kept working. She took the crowd over the the cafeteria area to discuss some school stuff, while I put the finishing touches on this color proof. It's pretty much what I expected, so I'm happy with the results. I'll sleep on it before deciding if it's done, or needs changes on subsequent copies. I went up to the Studio in the early afternoon. 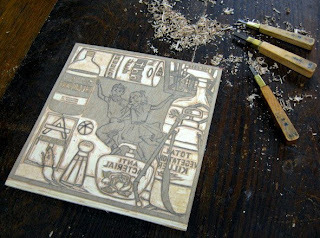 First step was to finish cutting the block, which was mostly cutting out the figures in the center. Took about 90 minutes, being careful. Then I found some paper, in this case some Rives BFK that must be left over from another project. Tore it down into the appropriate size. Then I inked and printed. Because I'm trying to get this done in time for a show coming very soon, I added a little ink drier to my ink, something I generally don't do. The first proof looked good, so I printed two more copies while I had the ink out. So far I like what I'm seeing. I think the composition works, I like the shapes, and I think the colors I have in mind will work. 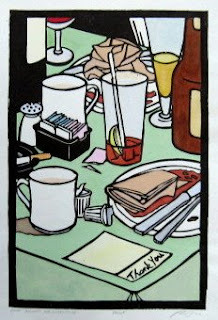 My plan is to color a proof tomorrow between work and the June meeting of the discussion group at 7 pm. If so, I'll have something very fresh to present to the group. Another long day, with working my day job, then helping to hang a show in Belmar, and then getting into the Studio for a few more hours of cutting on the new block. A lot of detail in this one, including a lot of text, so it's taking a lot of time. When I left off tonight, I had finished all the objects around the perimeter. 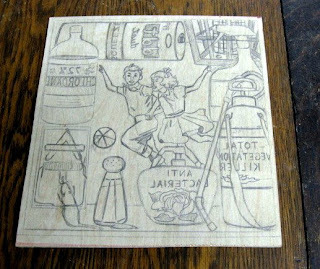 Tomorrow I go in and cut out the center, including the kids, and then it will be ready to print. I went up to the Studio in the afternoon to continue work on the Global Footprints project. In preparation, I had done some research on the internet and around the house, looking for vintage graphics to use on some of the objects. In the Studio I fixed a few of yesterday's items and added a lot more detail. The one reference I realized that I didn't have was the rose that I wanted to put on the container of hand soap. No problem- I just took a walk up Main Street into Ocean Grove and before long found several examples along side the sidewalk. 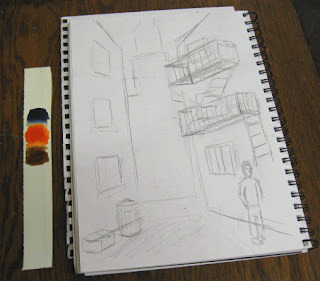 I chose one to sketch right onto the block. The last thing was to put the kids in the middle. I modelled them on the kids from my old Candyland board, but I'll make a few changes when I cut and color them. 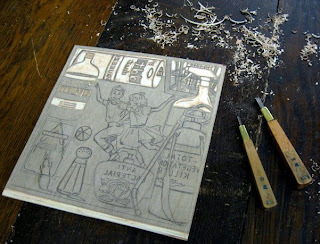 With the drawing finished (more or less) I decided to begin cutting the block. I finished the DDT can at the top, the Chlordane bottle on the left, and most of the bug zapper and spray bottle on the right. 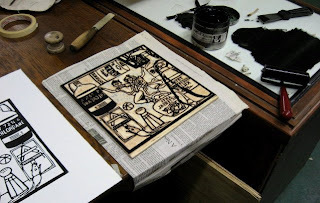 Tomorrow will be a busy day, but I'll try to get back to the Studio for a while, adjust any part of the drawing that needs fixing, as well as finish the cutting.